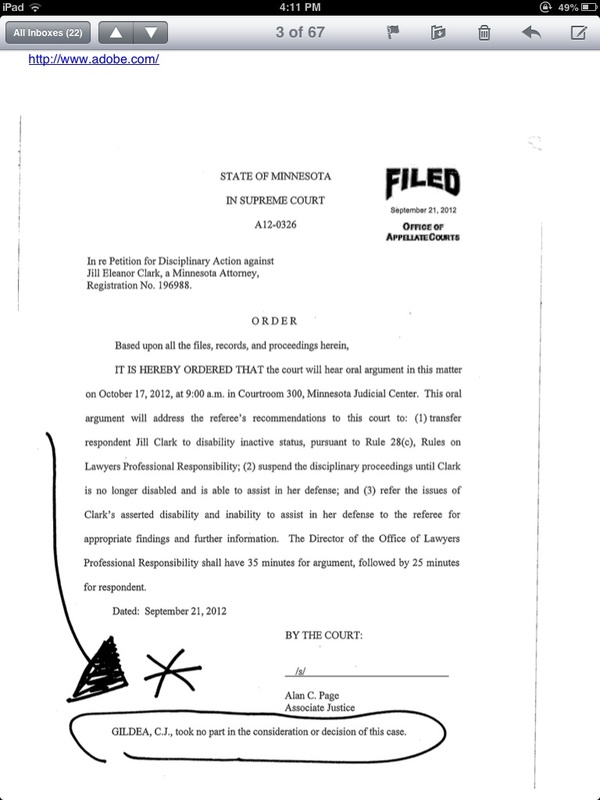 Below is one example of the many documents that emanted, apparently, from someone at the MN Supreme Court, claiming that Lorie S. Gildea took no part in the consideration or decision of the case In re Clark, file no. A12-0326. If anyone has information to support that statement, please disclose it via US mail to Jill Clark at the address for Jill Clark, LLC on file at the Supreme Court or to jillclarkcitizen@yahoo.com – by 5 pm May 23, 2013. If I receive no responses, I will be entitled to assume the statement that Gildea took no part is false, and that Gildea has failed timely to disclose her activities. Obviously, if anyone cares to disclose to me knowledge or evidence that Gildea did take part, please feel free also to transmit that. If you would like to do that, but fear retaliation, please send an email without any text in the body or re line. This entry was posted in Attorney rights, news about the lawsuit and tagged Attorney Jill Clark, Jill Clark, Jill Clark Attorney, Jill Clark Attorney Minnesota, Jill Clark blog, Jill Clark commentary, Jill Clark comments, Jill Clark Continues, Jill Clark Minnesota, Jill Clark Speaks, jillclarkcontinues, jillclarkspeaks, Justice Lorie S. Gildea, Lorie Gildea on May 18, 2013 by jillclarkspeaks. False statements in consideration points up the false promise, or the way in which the fraud is going to con the victim out of their property. In the example of the person who comes to the door claiming to be selling shoes (then takes your money and the shoes never arrive), the ‘false statement as to consideration’ is the con man’s statement that he will send the shoes. If he knew he was never going to send the shoes, if that was just a false promise to get your money, that is a badge of fraud. Your money is taken based on the belief that your case will be heard. The court had an opportunity to, but failed to disclose that the case would never be heard. 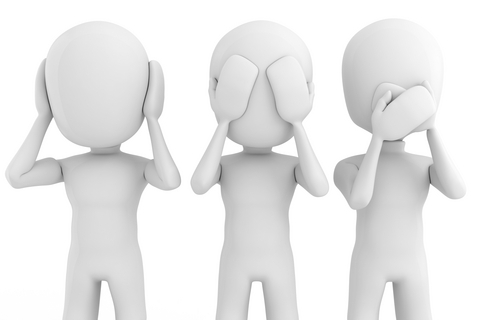 In that situation, the fraud is by silence (you are not told that there is a shadow system that sidelines cases, and you are not told that case your case has been sidelined – when that occurs), and by gesture (the clerk nods and receives the papers and the money, implying you have filed a ‘case’ or motion, or writ). You leave, having paid your money (not to mention the time and attorney fees already spent on the paperwork), believing the false statement as to consideration: that your case will be ruled upon by a judge(s). In this situation, the failure, the refusal to tell you before you pay your money that the case is not going to be decided by judge(s), is a false statement – by omission – as to consideration. May 16, 2013. No derivative works are authorized by copyright holder(s). This entry was posted in Scrutiny of Court Administration, What is Fraud? and tagged Attorney Jill Clark, Jill Clark, Jill Clark Attorney, Jill Clark Attorney Minnesota, Jill Clark blog, Jill Clark commentary, Jill Clark comments, Jill Clark Continues, Jill Clark Minnesota, Jill Clark Speaks, jillclarkcontinues, jillclarkspeaks, judicial reform on May 16, 2013 by jillclarkspeaks. This is being re-blogged from Jill Clark Continues. I also sent an email yesterday to Rita DeMeueles with the site address: www.jillclarkcontinues.wordpress.com so she would be sure to note the demand for disclosures. I have spoken with Rita DeMeules, MN Supreme Court Commissioner. I am aware that she reports directly to Lorie S. Gildea. I am also aware of documents purporting to be ‘orders’ in In re Clark, that state at the bottom, that Gildea “took no part” in the decision. How am I to believe that is true? When the staff report to her? 5) whether the motion to change status of email evidence filed February 2012 was considered and decided by the full Court, and if not – why not. Look, this is just for starters. I am going to have MANY MORE questions. May 14, 2013 (re-blogged May 15, 2013 on jillclarkspeaks). No derivative works are authorized by copyright holder(s). This entry was posted in About our justice system, Attorney rights, Scrutiny of Court Administration, What is Judicial Reform? and tagged Chief Justice Lorie Gildea, Chief Justice Lorie S. Gildea, court administration, court administrators, Jill Clark, Jill Clark Attorney, Jill Clark Attorney Minnesota, Jill Clark blog, Jill Clark commentary, Jill Clark comments, Jill Clark Continues, Jill Clark Minnesota, Jill Clark Speaks, jillclarkcontinues, jillclarkspeaks, Justice Lorie S. Gildea, Lorie Gildea, Lorie S. Gildea, scrutiny of court administration, what goes on behind the scenes in courthouse?, who is really running the courts? on May 15, 2013 by jillclarkspeaks. Advocate. One who assists, defends, or pleads for another. 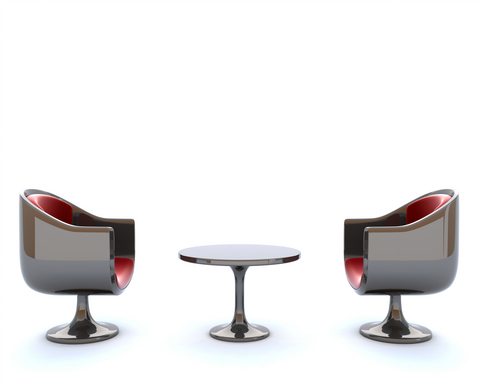 One who renders legal advice and aid and pleads the cause of another before a court or a tribunal, a counselor. A person learned in the law, and duly admitted to practice, who assist his client with advice, and pleads for him in open court. An assistant, adviser; a pleader of causes. (Sixth Ed., West Publishing Co., 1990). Advocate appear in various types of matters including domestic abuse cases (where they are common). This entry was posted in About our justice system, Attorney rights, What is an Attorney? and tagged Attorney Jill Clark, Jill Clark, Jill Clark Attorney, Jill Clark Attorney Minnesota, Jill Clark blog, Jill Clark commentary, Jill Clark comments, Jill Clark Continues, Jill Clark Minnesota, Jill Clark Speaks, jillclarkcontinues, jillclarkspeaks, judicial reform on May 12, 2013 by jillclarkspeaks. 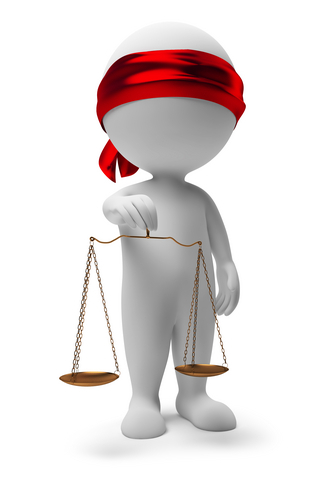 This series of posts will discuss the important question – what is an attorney? Definition from Black’s Law Dictionary, Sixth Ed. (West Publishing Co. 1990). This entry was posted in About our justice system, Attorney rights, news about the lawsuit, What is an Attorney? and tagged Attorney Jill Clark, Jill Clark, Jill Clark Attorney, Jill Clark Attorney Minnesota, Jill Clark blog, Jill Clark commentary, Jill Clark comments, Jill Clark Continues, Jill Clark Minnesota, Jill Clark Speaks, jillclarkcontinues, Minnesota Supreme Court on May 8, 2013 by jillclarkspeaks. I am asking that Lorie S. Gildea and any staff who report to her not handle this document. The letters indicated that but for a positive response mailed to my address, from each Justice, stating that each Justice had received the writ I filed January 2012 (and paid $550 for processing – not to go into some unknown coffers) and demanding a long-hand signed copy of any ruling thereon, that I would proceed accordingly. Authored by Jill Clark, May 3, 2013, all intellectual property rights reserved. This entry was posted in About our justice system, litigation documents and tagged Attorney Jill Clark, Chief Justice Lorie Gildea, Chief Justice Lorie S. Gildea, Jill Clark, Jill Clark Attorney, Jill Clark Attorney Minnesota, Jill Clark blog, Jill Clark commentary, Jill Clark comments, Jill Clark Continues, Jill Clark Minnesota, Jill Clark Speaks, jillclarkcontinues, judicial ethics, judicial reform, Justice Lorie S. Gildea, Minnesota Supreme Court, MN State Court Administrator on May 3, 2013 by jillclarkspeaks. Conroy removed – was a bench warrant issued AFTER removal? Below is a copy of the notice of removing Lois Conroy, signed by Trisha Farkarlun and provided to the Court 4/25/13. It was never explained why Judge Alexander, who apparently stated from the bench that it was her case, would have been removed by Administration, and Conroy put on the file. Why it is that members of the public are told they only have one removal (even if 20 judges are assigned – by virtue of Hennepin County ‘policy’) but Court Administration, which is not even a party, removes judges all the time – apparently any time they want. This is not ok. 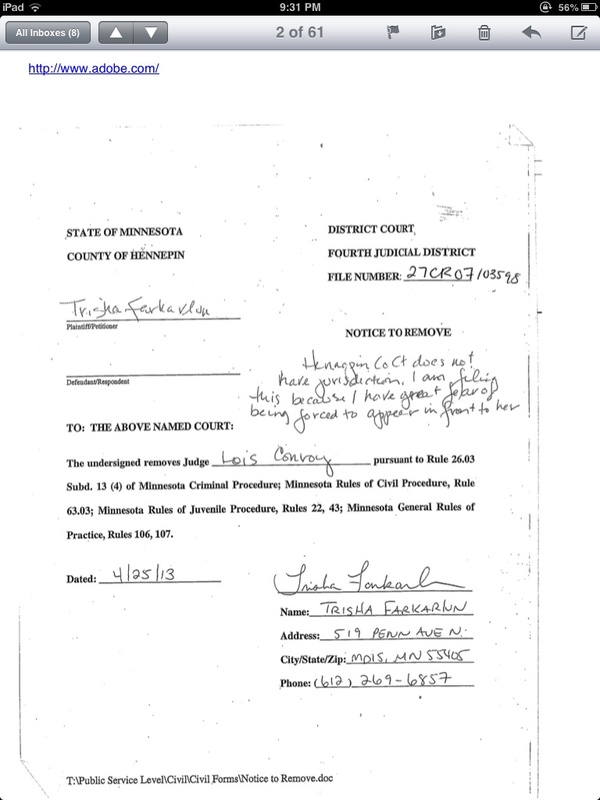 Even if Hennepin County Court had jurisdiction after Farkarlun’s conviction was REVERSED in 2010, Conroy surely did not have jurisdiction after the notice of removal was filed. 1. Why was Alexander removed? Who made the decision? 2. Why was Conroy put on? And why such late notice? I am specifically asking whether the switcheroo was because of the removal papers. 3. Did someone testify under oath in favor of a bench warrant? What facts supported probable cause that a crime had been committed? I cannot imagine that there are any. Was the warrant just a MnCIS entry? And if so, who made the computer entry? Why can’t I look at MnCIS and tell what human being will stand by this warrant? This entry was posted in About our justice system, litigation documents, News about suing the Minnesota courts, news about the lawsuit and tagged Attorney Jill Clark, bench warrants, Chief Justice Lorie Gildea, Chief Justice Lorie S. Gildea, illegal bench warrants, Jeff Shorba, Jill Clark, Jill Clark Attorney, Jill Clark Attorney Minnesota, Jill Clark blog, Jill Clark commentary, Jill Clark comments, Jill Clark Continues, Jill Clark Minnesota, Jill Clark Speaks, jillclarkcontinues, jillclarkspeaks, Justice Lorie S. Gildea, Lois Conroy, Lois Conroy Hennepin County, Lois Conroy Minnesota, Lorie Gildea, Lorie S. Gildea, Minnesota Code of Judicial Conduct, Minnesota Constitution, Minnesota Judicial Standards Board, Minnesota Supreme Court, MN State Court Administrator, Pamela Alexander, Pamela Alexander Hennepin County, Pamela Alexander Judge, Trisha Farkarkun, Trisha K. Farkarlun on April 28, 2013 by jillclarkspeaks.